Imagine that you have worked on a home renovation and your house shines with fresh beauty. There is one problem, though. What do you do with all that rubbish from the remodel? You could try hauling it away yourself, or you can use us, the number one Upper Mount Gravatt skip company. We are trusted because of our focus on speedy service and customer satisfaction. We want to ensure that you can clear your property of waste as quickly as possible. To that end, we offer skip hire delivery to Upper Mount Gravatt within twenty-four hours of you ordering with us. If you need a skip on the same day, order before noon and we will gladly meet your order. Place an order with us and discover why we are the most trusted company for skip bin hire in Upper Mount Gravatt. We make clean up easy. If you are looking to hire a skip bin in Upper Mount Gravatt, Lightning Skips is the only company to contact. Though we have only been operating for about a year, our commitment to our customers has made us the go-to business for skip hire in Upper Mount Gravatt. We will listen to your needs, and suggest the skip bin that we think you should hire to meet your task best. Once we know what you need, we will deliver your order, and when you are done with it, we will take it away to a disposal site near Upper Mount Gravatt. Our mission is to make getting rid of your rubbish as easy and painless as possible. 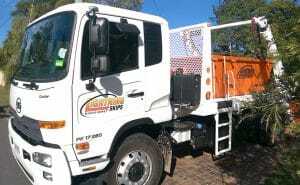 For Upper Mount Gravatt skip hire service you can trust, reach out to Lightning Skips. We pride ourselves on helping you. We understand that each job requires different materials, and a clean-up is no different. For this reason, we carry a large selection of sizes for you to hire in Upper Mount Gravatt. If you have a small job that does not need a large skip bin, we have the mini skip bin for you to hire. If you have a large job or need to hire more than one skip bin, have no fear; we offer larger sizes, up to 8 cubic metres. If you are unsure of what size you need, we will be happy to discuss the matter with you. We are the most trusted name in waste receptacle rental services in Upper Mount Gravatt for a reason. Our skips are well-cared for and cleaned after every job. We want to make sure you have the best experience possible when you choose us because we know you have many options when it comes to getting rid of lawn, house, and construction rubbish, but we want to be the company you choose. We want to assist you with cleaning up your Upper Mount Gravatt property. Lightning Skips guarantee to deliver your skip within 24 hour of contact, sometimes this can be the same day if booked before 12PM.